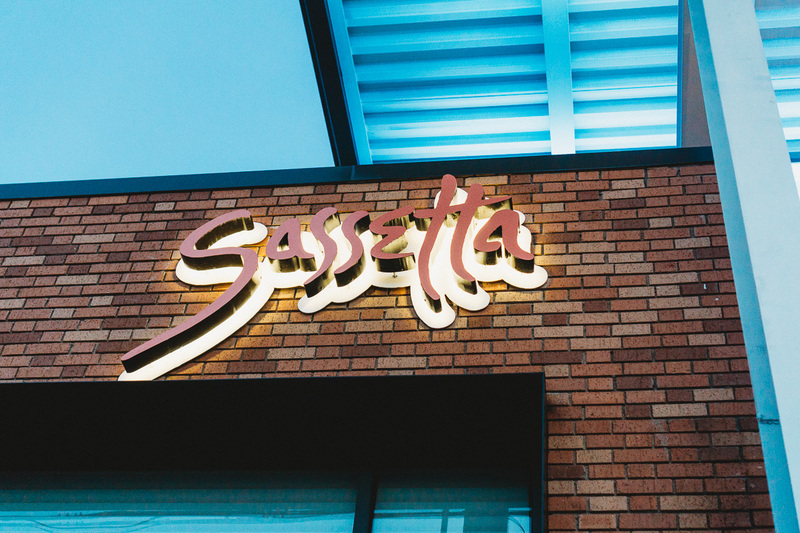 We’ve been looking forward to trying Sassetta ever since this hot new restaurant opened in the heart of the Dallas Design District. We finally got our chance last weekend when we snagged a table for dinner. Sassetta definitely did not disappoint – everything was delicious from the cocktails to the food! The space is bright and airy with a sophisticated yet relaxed vibe. The interior design was as visually as pleasing as the food was tantalizing. We grabbed a cocktail at the bustling golden bar before dinner and were pleased with the well curated selection of Italian wine and beer in addition to the creative cocktails. The classic Peach Bellini was the perfect pre-dinner cocktail. Our husbands enjoyed the Godfather, made with scotch, amaretto, and bitters. 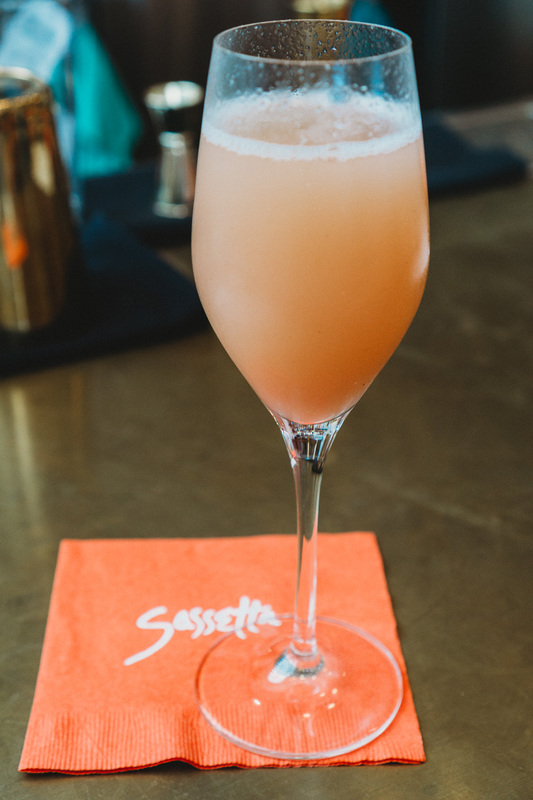 Next time, we’re going to try the Sassetta Spritz – an intriguing blend of aperol, prosecco, and rosa vermouth. After perusing the menu, it became clear that deciding what to order was going to be a tough decision given all the mouthwatering choices. We finally settled on the Fritto Misto and Dry-Aged Beef Meatballs with Ricotta to start. Both appetizers were amazing, but we particularly loved the unique Fritto Misto. 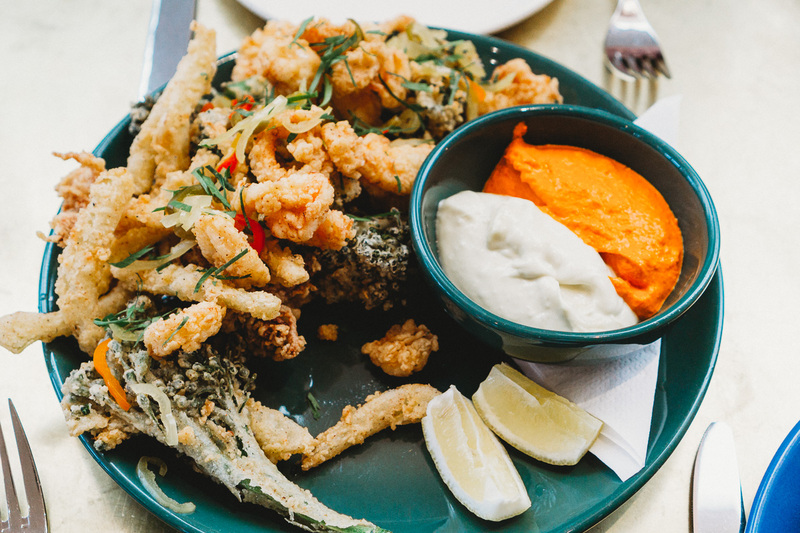 It was comprised of perfectly battered and lightly fried shrimp, calamari, and vegetables served with Calabrian Chili and Lemon aiolis for dipping. We were pleasantly surprised by how delectable the fried broccolini was. 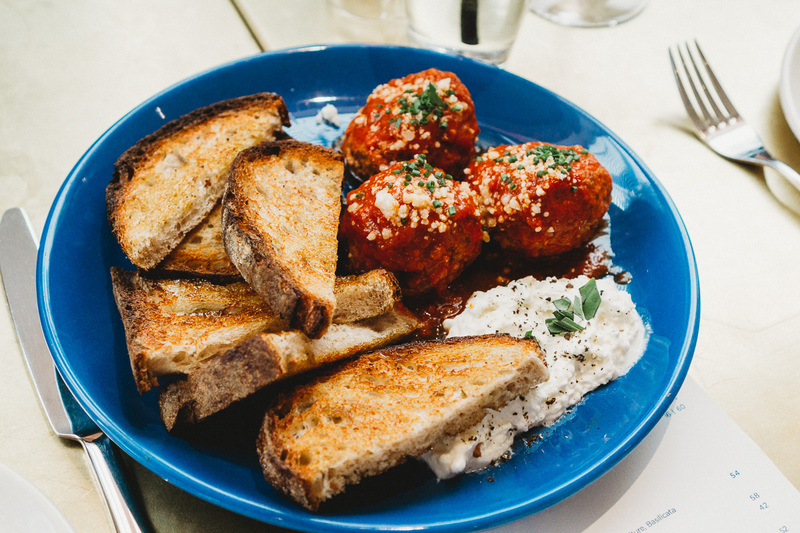 The Dry-Aged Beef Meatballs were also thoroughly delicious and drool-worthy, served with house-made ricotta and freshly baked sourdough bread for soaking up all the flavorful goodness. We also tried several of the salads to include Shrimp Panzanella and the Chopped Salad. At some restaurants the salads are almost an after thought and fail to really excite the palate, but that is certainly not the case at Sassetta. The salads stood out for their flavor and creativity just as much as the rest of the menu items we tried. 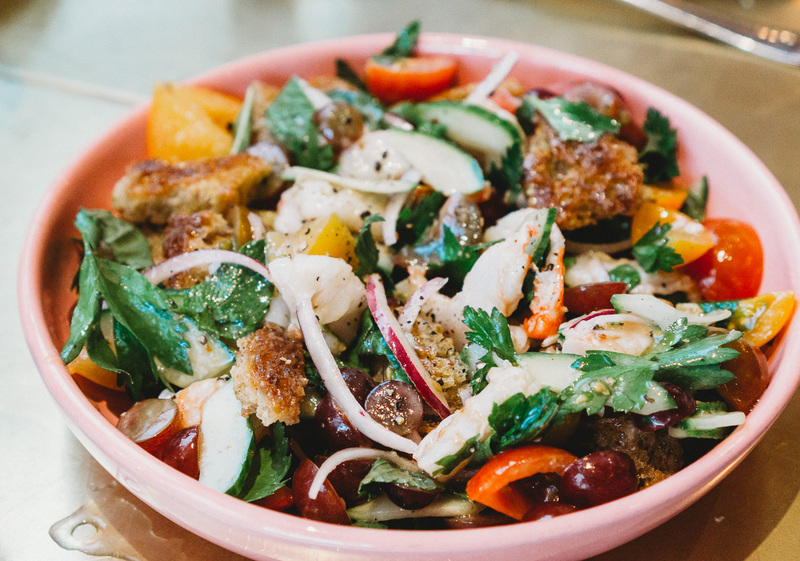 The Shrimp Panzanella was exciting and fresh and packed with flavor from the shrimp, sourdough croutons, cucumber, heirloom tomato, grapes, and red wine vinaigrette. 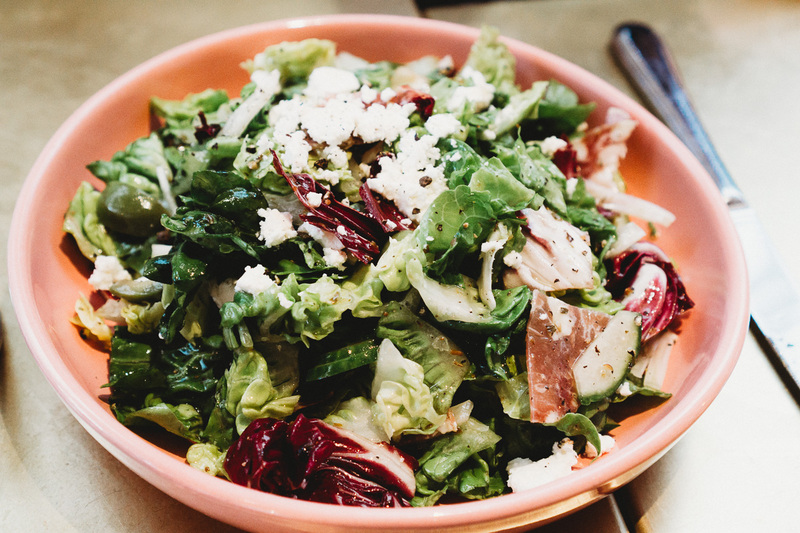 The Chopped Salad was a nice twist on the Italian classic, made with fennel salami, olives, feta, and oregano vinaigrette. For entrees we ordered the Parpadelle with Ragu Bolognese and the Fennel Sausage Pizza with Pickled Peppers and Fontina. When it comes to Italian cuisine, Bolognese is one of our all-time favorite dishes so we had to try Sassetta’s take on the classic dish. 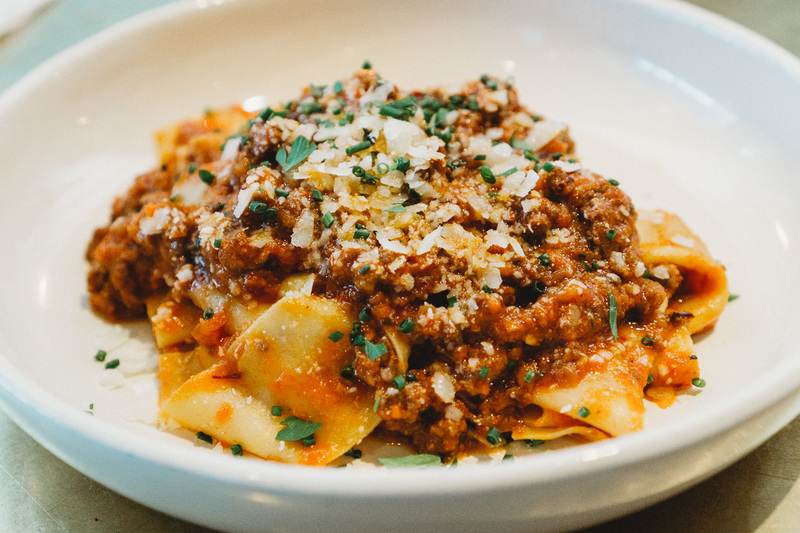 The Parpadelle was cooked perfectly and the meaty bolognese ragu was so savory and indulgent – classic Italian comfort food. Sassetta’s Bolognese turns up the heat a notch with chili flakes that add a nice unexpected twist on the classic dish. 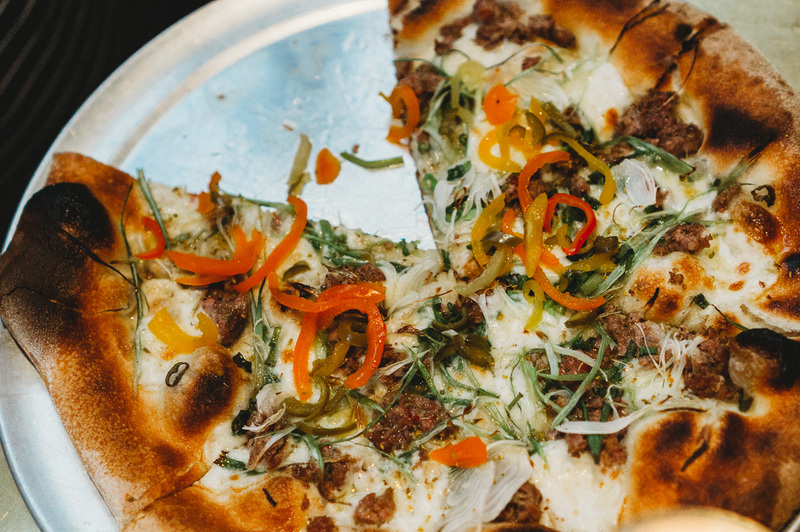 When we saw the Fennel Sausage Pizza with Pickled Peppers and Fontina on the menu, we were intrigued by the unique flavor combination. The pizza was delectable and bursting with flavor, so much so that we devoured every last bite of it. We ordered the Taleggio, Parmesan, Black Pepper, Burnt Honey Pizza too (not pictured) and it was noteworthy as well. Although we didn’t save room for dessert, we heard the Lemon Layered Cake made with Olive Oil Chiffon, Pine Nuts, and Rosemary is fantastic! From the contemporary interior decor to the bustling atmosphere to the innovative twist on Italian classics, we loved every moment of our dining experience at Sassetta and will definitely be back soon. This new restaurant in Dallas is a must try! 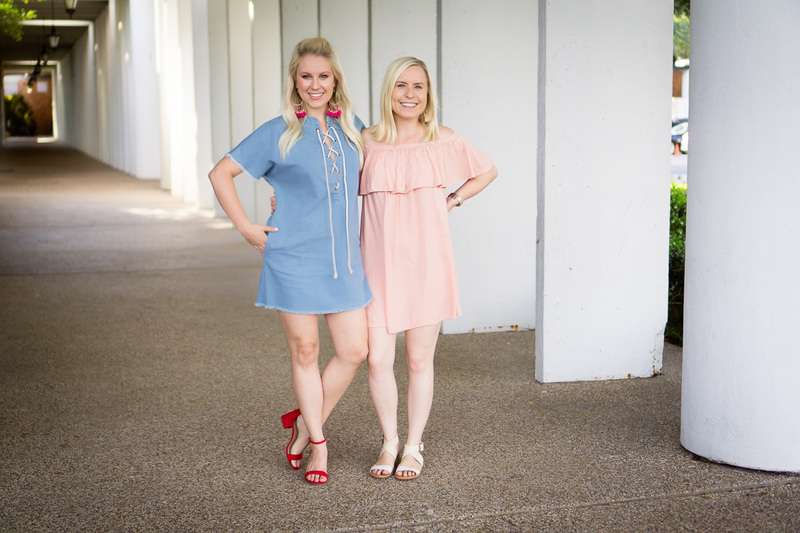 We love getting dressed up for dinner and were thrilled when TOBI sent us these two super cute and comfortable dresses. We have to mention the comfortable aspect because we were carbo-loading without shame and needed to still look cute while hiding bellies full of delicious pasta! If you’ve never shopped TOBI before you have to check out their site! They have so many options with a lot of them being under $50! Dress: TOBI c/0 $33 dollars with code WS50 | Earrings: Tassel Drop $32, love these too! | Watch: MICHELE Deco Diamond Dial Two-Tone | Shoes: Similar here and on sale for $41! | Clutch: similar here & love this one for only $29!